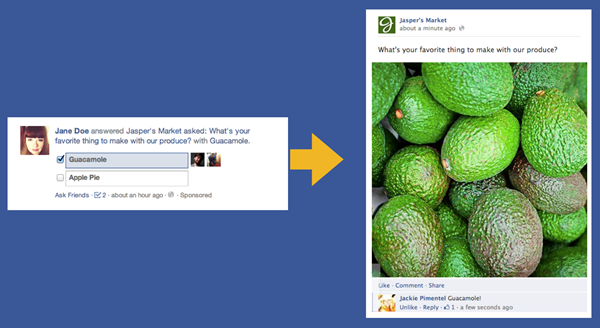 Facebook marketing is complicated. In many ways, it’s too complicated. Marketers have to navigate the waters of EdgeRank to make sure their content makes it to the News Feed, choose from multiple ad formats to find the one that best meets their objectives, follow specific and arguably arbitrary rules like having no more than 20% of an image include text to promote it and more. Navigating Facebook alone is a full-time job, and I’m not the only one who thinks so. Facebook agrees, and it aims to simplify things. Facebook is cutting its 27 different ad products by half. Ads that feature a friend’s interactions with something a brand is promoting (also known as Sponsored Stories) are gone. Facebook Questions are being removed from Brand Pages as brands can simply ask questions in their post copy. Facebook Offers are going away. All of this is in an effort to simplify things and make Facebook marketing just a tad easier. These changes mean social context that was once created by Sponsored Stories will be added to all ad units automatically. Ad units will be more consistent in formatting, allowing marketers to test and optimize multiple units with the same creative sizes. Facebook marketing just got a bit more approachable. Marketers have a lot (let me say that again… a lot) of options in the social media space alone, and Facebook has been under scrutiny for how it treats marketers and the value it provides. Facebook’s approach to simplify ad products and help marketers make the right decision by providing fewer of them is a smart one. Being too complicated has led some advertisers to choose the wrong products for their desired objective. By providing fewer options, Facebook is giving marketers more clarity and the feeling of greater control, which should improve Facebook’s reputation among marketers. Facebook plays an important role for many brands, but Facebook changes the rules, whether they admit it or not. Brands have felt burned in the past after working hard to build fan bases only to find out they can’t reach that entire fan base organically. Some marketers are looking at the wealth of tools at their disposal while Facebook takes steps to be more attractive. It has a massive user base, but that user base is only valuable if marketers feel they can effectively reach it. Facebook and other online platforms can change the rules whenever they want. Marketers would be wise to diversify their online presences and test and learn with multiple channels and methods of communication. That way if one changes the rules or gets too complicated, resources can be reallocated. Facebook understands this, and it’s aiming to prevent resources from going elsewhere. Posted in Facebook and tagged with Facebook, Ads, Sponsored Stories. June 11, 2013 by Taylor Wiegert.